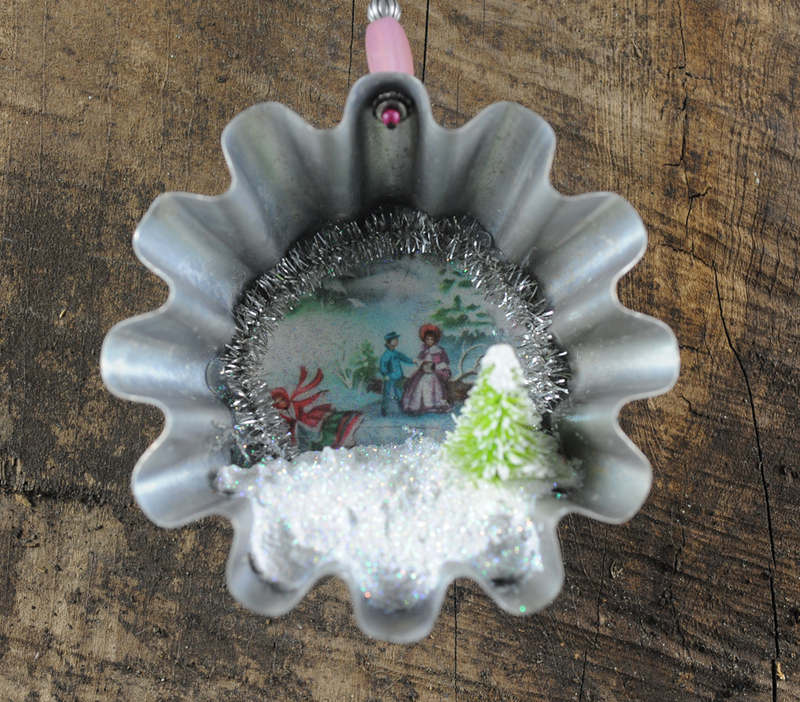 Metal tart tins are very popular for upcycled Christmas ornament crafts. I’ve looked at many online and in magazines and knew I had a stack of tins in my studio. 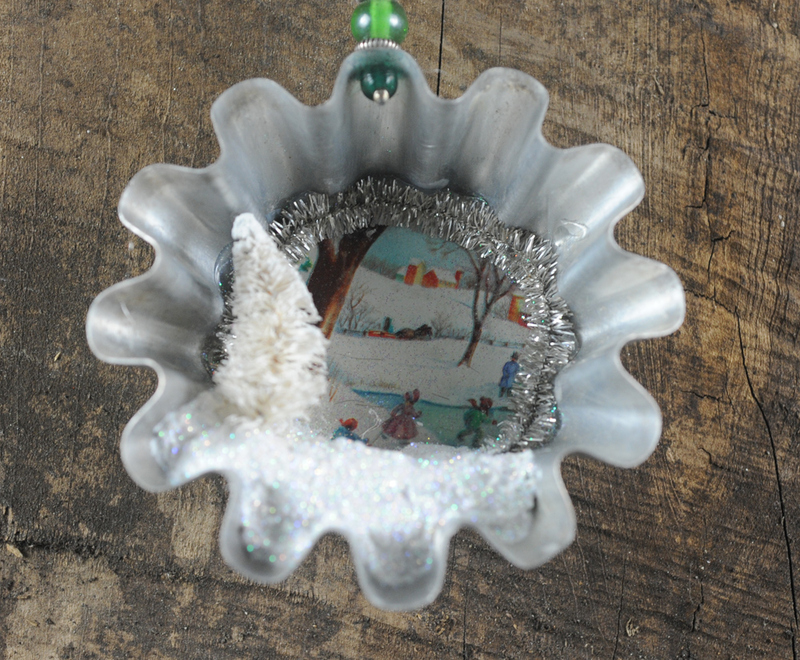 Here’s my take on the tart tin ornament – I used vintage scenic Christmas cards, resin, mini tinsel garland, paper clay, Snow-Tex, glitter, and little bottle brush trees. I made a bunch of these for my annual ornament gift to the women in my Bible study. Each tart tin is just under 4″ in diameter and about 1 1/4″ deep. I cut the images from vintage Christmas cards, and coated them with several layers of paper sealer. I then glued them into the bottom of the tin and poured a layer of Ice Resin on top. 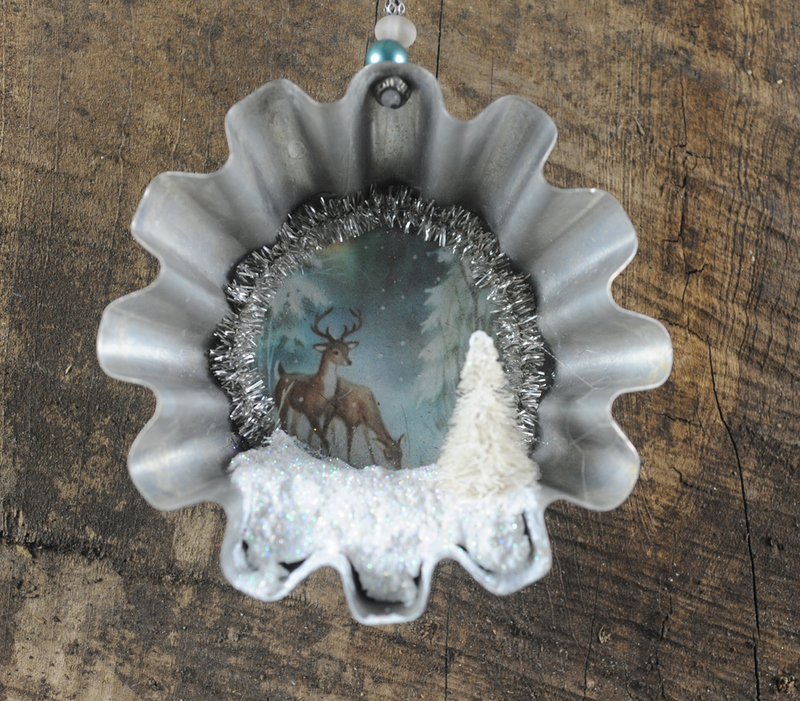 When the resin was cured, I glued mini tinsel garland around the image to block any gaps that showed. 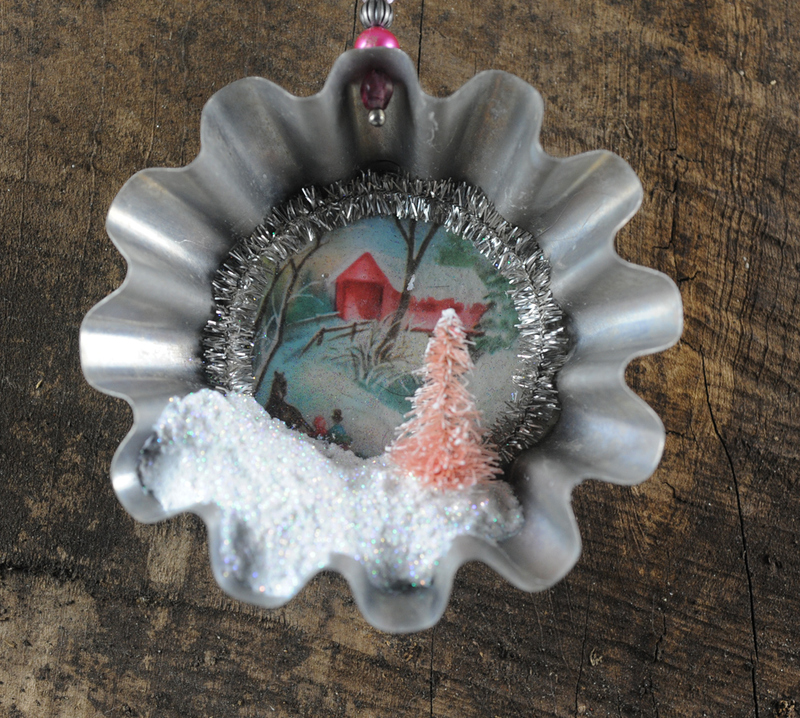 I then took paper clay and shaped it in the front bottom of the tin to make a mound of “snow”. When the paper clay had dried, I covered it with a layer of Deco-Art’s Snow-Tex dimensional snow product. I quickly poured on some fine glitter, tapped off the excess, then set aside to dry. Next I glued in a tiny bottle brush tree. I removed these from their bases and poked a hole into the clay with an awl. To hang the ornaments, I used a metal hole punch to pierce the top, then threaded some beads onto a head pin and finished it with a wrapped loop. A small piece of silver cord tied onto the loop finishes it off. I hope you enjoy seeing my take on this project. Here’s wishing you and yours a Merry Christmas and a Happy New Year! This entry was posted in christmas, ice resin, recycled creations and tagged Christmas, craft your stash, ice resin, ornaments, recycle, snow-tex. Bookmark the permalink.